his powder beautifully blurs the skin -- almost doing the work of an Instagram filter. It also leaves skin slightly dewy, which is in line with the natural, glowy skin look that's been so in lately. My hesitation with recommending this product comes with the latter quality because I don't think people who are looking for a traditional setting powder will be satisfied with this, as the finish is de...read morefinitely not matte and does not do a ton to hide shine. But for those going for a natural, dewy look; this very well may be your dream powder. I've steered clear of most setting powders because they tend to make my skin look too flat. I want to set my makeup and keep my t-zone shine-free, but still have a natural satin-y finish to my skin, so my lines aren't accentuated. I love this powder for all of those reasons. It's almost like a complexion balancer -- doesn't dry out my dry patches, but keeps my t-zone in check while providing a natural finish. 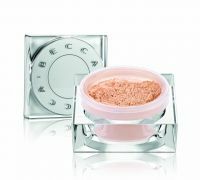 This was a nice setting powder - again no applicator so this one lives at home (not very mobile.) It does offer a nice "blurred" appearance and keeps shine at bay. I like this one a lot!